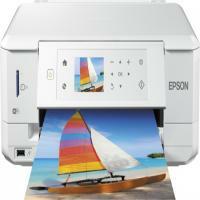 The Epson XP 635 is a wireless all-in-one printer that offers high-resolution prints. The printer has many advanced features including, duplex printing, PC-free operations, CD/DVD printing, direct printing and more. The device has an attractive design and weighs approx. 6.7 kg. It has two paper trays (100-sheet plain paper and 20-sheet photo paper) and one CD/DVD holder. The printer has a large 6.8 cm display screen along with navigation keys and function buttons as the control panel, at the front of the device. Epson XP635 has an automatic duplexer and a flatbed scanner. The printer offer high-resolution output with the maximum resolution of 5760 x 1440dpi. It also allows the users to directly print from digital cameras, thumb drives, and/or memory cards. The Epson XP635 is a decent all-in-one printer for home users and small businesses. The printer offers high quality prints at the speed of 32 ppm. It is a print ready wireless device that comes with attractive features like multimedia handling, duplexer, PictBridge ports, card reader and more. The device might not be able to handle the print heavy office work but would be a perfect fit for tech loving home users. These cartridges are also available in EPSON XP 635 ink multipack. How to resolve the poor print quality issue of Epson XP-635 printer? Use of Epson XP-635 ink cartridges and good quality paper will help you get better print quality. How to solve print issue over the network ? Printer will print fast if it is in the same network as the computer. Hence, keep both in same network for better printing. How to Replace the Epson XP 635 Ink Cartridges? Make sure the CD/DVD tray is not inserted for printing. If it is please take out the tray and turn on your printer. If the ink cartridges are empty, you must be getting an error message on the LCD screen. Select the cartridge that needs to be replaced. Now go to the options to replace the cartridge and press Ok button. If you are replacing the cartridge without any message appearing on the LCD screen of the printer. Then, press the Home button on the printer and select Setup. Go to Maintenance > Ink Cartridge (s) Replacement and press the Start button. Once have indicated the printer for a cartridge replacement, lift up the scanner unit. Be careful and do not touch the flat white cable inside the printer. Unpack the new Epson XP 635 ink cartridge. Shake the cartridge gently for four or five times (only the black ink cartridge). Carefully remove all the packaging material and make sure you do not touch the ‘chip’ on the cartridge. Push the blue tab near the cartridge that you want to replace and lift the cartridge up from its bottom. Repack the empty ink cartridge with the cap that came with it and store it aside for recycling purposes. Remove the cap of the new ink cartridge and keep it safely for later uses. Now insert the cartridge in the cartridge slot and press the bottom of the cartridge (till you hear a ‘click’ sound, to make sure it is properly inserted). Once you are finished with replacing all the Epson XP 635 ink cartridges that were required to be replaced, put down the scanner unit. The printer would start priming the ink and will display a completion message on the LCD screen, after a few minutes. Q. What is the difference between compatible Epson XP 635 ink cartridges and the original ink cartridges? A. You will not notice any difference in print quality and performance while using our compatible Epson XP 635 ink cartridges with your printer. The difference between compatible ink cartridges and the original ink cartridges is that, original ink cartridges are manufactured by the printer company itself. Whereas, compatible ink cartridges are manufactured by third companies. Also, our compatible ink cartridges are cheaper than the original counterparts and can yield more pages per ink cartridge. Q. I have been using original ink cartridges for my Epson XP 635 printer. However, buying original ink cartridges are too expensive for me and I wish to reduce my operational costs without compromising on the print quality. A. If you wish reduce your operating costs without compromising on quality, our compatible Epson XP 635 ink cartridges are the perfect choice for you. They are XL ink cartridges which are cheaper than the original ink cartridges and can produce the same print quality as the originals. Q. Are the compatible Epson XP 635 ink cartridges chipped as well? A. Yes, our compatible Epson XP 635 ink cartridges are chipped so as to maximise convenience for the user. Chipped ink cartridges enable the printer to read the ink levels remaining in the cartridge so that you have a replacement ready when the ink levels are running low. Q. How do I print on both sides of the paper with my Epson XP 635 printer connected to a Macintosh computer? Load the desired paper media into the printer. Open the image or file that you want to print and access the print dialog box. Select the “Two-sided printing” option on from the pop-up menu. Choose the appropriate settings according to your requirements. Q. I’ve been using compatible Epson XP-635 ink cartridges since a few months. I receive notifications for firmware updates, which I know should be avoided but is bothering me no end. Please help me deal with it. A. Since there are no escaping firmware updates if you are using compatible cartridges you need to make sure that you stay alert and don’t update your firmware no matter what happens. Also, turn off the auto updates in the software options of your printer. Q. Do colour ink cartridges in the Epson XP-635 ink cartridges print more pages than black cartridges do? A. Yes, the output of the colour cartridges in the Epson XP-635 ink cartridges is more than it is for black. Q. I need good ink cartridges for high-quality photo printing at reasonable cost for my Epson XP-635 printer. If I choose the compatible version of Epson XP-635 ink cartridges will I get the same results that original cartridges yield? A. Yes, compatible Epson XP-635 ink cartridges are equipped to deliver top quality results for photo printing jobs and also cut down on printing costs by 40%. You’ll find no difference in the output that these compatibles yield so you can opt for it. Q. My printer is not recognising the new Epson XP-635 Ink Cartridges that I installed recently. Can you please tell me some simple steps that I can take to resolve the issue before contacting customer support or something? Thanks. A. To begin with, please remove all the cartridges from the printer, turn it off from the main switchboard and leave it like that for 20 minutes. After that, switch your power button on at the main switchboard and then turn on the printer and reinstall all the cartridges. You can also wipe the cartridges and its chips with a damp cloth as it will open up the dirt particles on its chip, which prevent an uninterrupted contact with the printer circuit board for printing smoothly. Q. Do compatible EPSON XP 635 ink cartridges print less pages than the original cartridges do? Is the quality of printouts of the former is good? A. Compatible ink cartridges don’t print less than the original cartridges; in fact, they cost lesser and thus print more. The output quality of the compatible ink cartridges is also every good. Q. Are EPSON XP 635 ink cartridges easy to install? A. Yes, installing these ink cartridges is very simple and convenient to do. Q. I can see a yellow label on the surface of compatible EPSON XP 635 ink cartridges. Should I remove the label before installing the cartridges or let it be there? A. You need to remove the yellow label before installing the ink cartridges. Please lift it and then pull it briskly in the opposite direction before installing the cartridges. Q. Is it advisable to remove ink cartridges from the printer if I don’t intend to print for a few weeks? A. Yes, please remove the ink cartridges from your printer and store them carefully if you won’t be printing for days at a stretch. Q. What about compatible EPSON XP 635 ink cartridges? Are they available as high capacity cartridges or only genuine cartridges are like that? A. Yes, compatible ink cartridges, including EPSON XP 635 ink cartridges, are created as high capacity cartridges and function well as their genuine counterparts. Q. Can you provide quick delivery of compatible EPSON XP 635 ink cartridges whenever a need arises? How can I avail quick delivery service? A. We offer services like quick delivery, easy returns, etc. on our products so that you have an easy and smooth shopping experience. To avail quick delivery, you need to place your order early in the day, before 12.00 noon. If your product is available and there are no external issues in the environment, you will receive your order promptly. Q. Is the Epson XP 635 printer heavy? Or I can take it out from one place to another easily? A. The Epson XP 635 printer weighs approximately 6.7 kgs. This makes it a very lightweight and easily portable machine. So you can easily carry out your Epson XP 635 printer from one place to another place. Q. Does the Epson XP 635 printer offers scanning functionalities? A. Yes. The Epson XP 635 printer offers scanning functionalities. It has a flatbed scanner for scanning. Q. During printing on the document, the printer shows an error message "Ink cartridge empty". How to resolve this? A. If your Epson XP 635 printer shows such message, then it indicates that the ink level has not been correctly recognised by your printer. So confirm by clicking on OK. This does not prevent printing and will not damage your printer. Q. Does the Epson XP 635 printer contains the paper feeding tray, front or rear loading. A. Yes. The Epson XP 635 printer contains paper feeding tray, front or rear loading. Q. What do I do if an Epson XP 635 ink cartridge leaks into my Epson XP 635 printer? A. This may be due to the fault in your cartridge. In that case, you must replace the cartridge currently installed in your Epson XP 635 printer. Q. The message "Cartridge incorrectly installed" appears on my Epson XP 635 printer during printing. How to resolve this? A. This message indicates that the Epson XP 635 ink cartridge has not been correctly inserted. The message can be appeared due to various reasons. You can try out following solutions, to resolve this issue. Check whether the guides in the cartridge slot of the printer have not moved. Take out the cartridge and insert the cartridge again. After that, press it firmly into the base of the slot. If still the message persists, replace the Epson XP 635 ink cartridge installed currently in your printer. Q. What does individual inks mean? A. Individual inks refers to the ink that is used in the printer. Some printers only use Colour and Black, which means even if it is only yellow that meeds replaced within the colour the whole cartridge has to be replaced. However with an individual ink printer such as the Epson XP-635, there are 4 colours. So when the Magenta runs out, all you need to replace is magenta. This in turn saves you money! Q. Is there a screen on this printer to see what your printing? A. Yes there is a 6.8cm LCD screen which allows clear navigation on the Epson XP-635. Q. Can I connect wirelessly to this printer, M. McClorey. A. Yes the Epson XP-635 can be printed via wireless from a range of devices such as Apple products, Andriod and laptop/desktops. Q. Are the cartridges for the Epson XP 625 printer same as the Epson XP 635 ink cartridges? Q. My Epson XP 635 printer is showing message as “Cartridge used or not genuine”. What should I do? A. Please ignore this message. This a warning from manufacturer to users against using the compatible or recycled cartridges. This does not prevent printing and will not damage the printer. Q. How long will the reusable / compatible Epson XP 635 ink cartridges last? A. There is no such time limit defined for the compatible ink cartridges, they can last indefinitely. They can last for years. However, a chip can go bad due to stray electricity, getting wet and even being touched by sweaty hands. Q. What Window OS works with Epson XP 635 printer? Q. My Epson XP 635 printer makes noise while printing / loading. What do I do? A. Noise from the printer can occur if the cartridge is installed incorrectly. First, make sure the cartridge in the printer is installed correctly. If not, remove the cartridge, re-insert it and press it firmly to the base of the slot. If the problem still occurs, try replacing the cartridge. Q. Why does the ink light remain lit after I have just installed a new compatible cartridge into my Epson XP 635 printer? A. Manufacturers have patents on the cartridge chips that are used to detect ink levels in the printer. Compatible cartridges therefore cannot contain these chips, this results in non detection of ink levels. However, this will not prevent printing. Also, you should check if all protective caps and tabs from Epson XP 635 ink cartridges have been removed and the cartridges are inserted to the base of the slot (you should hear sound as there is a lock in system at base). Also, you should check if the correct cartridge is inserted in the slot as there are specific colour slots available for the specific colour cartridge. Q. I have purchased several quantities of multipack Epson XP 635 ink cartridges. How should I store them? A. The multipack Epson XP 635 ink cartridges should be stored in a dry place and at room temperature for future use. As these ink cartridges both original and compatible are continually improved & optimized over time by the manufacturers, so we recommend not to store them in bulk quantities. Q. Is the Epson XP-635 printer / scanner compatible with a laptop running Windows 10 with a 64 bit system? Q. Can these Epson XP 635 ink cartridges be renewed individually? A. Yes, you only need to replace the cartridge from the printer which runs out of the ink, also make sure there is some ink remaining in every separate cartridge of your Epson XP 635 printer that is black, photo black, cyan, magenta and yellow in order for the printer to work.